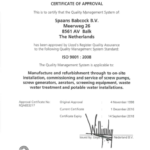 Since 1998 Spaans Babcock bv has been certified with the quality label ISO9001. In 2016 the auditors of Lloyd’s Register Quality Assurance have conducted their 2-yearly certification review which resulted again in a renewal of the ISO9001:2008 certification. The ISO9001:2008 standard requires greater attention to quality management; the new standard provides a company insight in the connection between product quality and concern success, contributes to a larger measure of customer satisfaction and to improvement of management systems. Spaans Babcock bv is SCC**-certified since 1999. 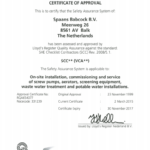 The SCC**-certification is developed to test the safety control systems of servicing companies in an objective and structured way. The SCC**-certification can be compared with the OHSAS18001 certification. Spaans Babcock bv meets all the requirements for the SCC** certification and passes the yearly audit every time successfully!